A new city wide litter campaign, ‘Clean Up Edinburgh’, will be launched on 28 October. We will kick start our campaign with a day of action on 29 November, bringing together communities, businesses and individuals across Edinburgh for clean-up events across the city. A Keep Scotland Beautiful survey showed that more than half of the Scottish population has dropped litter, and almost half do it regularly. This is a problem for all of us, caused by most of us. That is why Keep Scotland Beautiful have launched the Clean Up Scotland campaign to tackle these issues nationwide, and we are proud to be supporting this. Edinburgh is a beautiful, vibrant city but litter can be a blight on our landscape. Litter can have a huge impact on quality of life, our environment and costs us millions to clean up. We want to encourage staff, residents, schools, communities, business and visitors, to all play a part and pledge to tack action on litter and be proud of the city we live in. In a nationwide poll by Zero Waste Scotland, 44% of the Scottish population believes that a major education and awareness drive is the best way to tackle our litter problem, with only 10% opting for investing more in clearing it up. We therefore hope this year long programme of engagement and awareness raising activity can help us to start changing people’s attitudes towards littering. Or why not encourage your community to organise their own clean-up? We can provide advice on locations, health and safety and promotion. We can also provide some equipment if necessary. Let us know if you do have know of any events planned and we can help promote it. Use your own traditional and social media channels to tell the world that you are committed to making a difference. 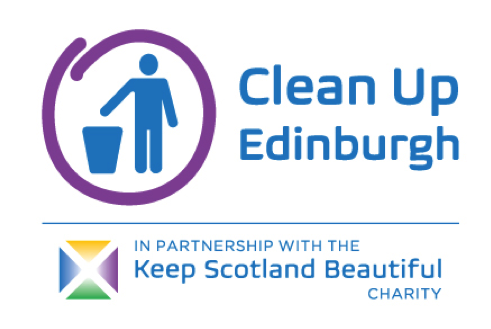 Don’t forget to use the hashtag #cleanupedinburgh for any online communications you send out.